Hi All. Its been ages know. I'm nearly done on Wibbly just down to note making duties. The new show looks set to begin about now. I've been taking a few days off with lovely Claire. Great spending some quality time together. Sunday I fly out to Spain for Animacor’09. I've been invited to be on the Jury this year. I'm looking forward to meeting some new friends. If you're going I'll see you there. 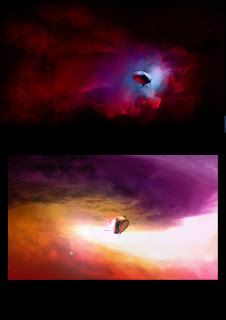 Images are quick paints for a new film idea. You got to love the power of photoshop brushes! I'll post again when I get back. wow this is really beautifull! I love these !! The backgrounds remind me of the 80's Flash Gordon movie !! !